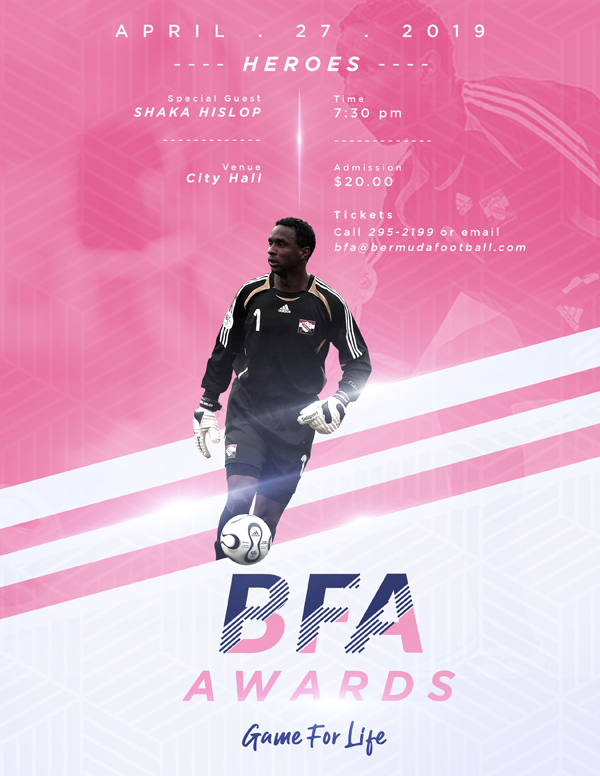 The Bermuda Football Association will hold its annual Awards Gala on Saturday, April 27th at City Hall in Hamilton, with former Trinidad & Tobago international and West Ham United goalkeeper and current ESPN FC Analyst Shaka Hislop as the special guest. A spokesperson said, “The Bermuda Football Association [BFA] Premier and First Division League season came to an end yesterday Sunday, April 14th with an entertaining FA Cup Final which produced a 5-goal thriller between Premier League Runners-up Robin Hood and the ever-present X-Roads Warriors at the National Sports Center. “There were some outstanding performances throughout the season; full of highs and low but now is the time for the Association to turn its attention to celebrating and acknowledging those individuals and teams whose performances deserve our admiration. “The Association will hold its annual Awards Gala on Saturday, April 27th at the majestic City Hall in Hamilton at 7:30 p.m. This years’ Awards theme is fittingly titled “Heroes!” Never more important is the need for our Island community to highlight all that is good about Bermuda and sports has always been recognized as a vehicle in which to promote the best of the best. 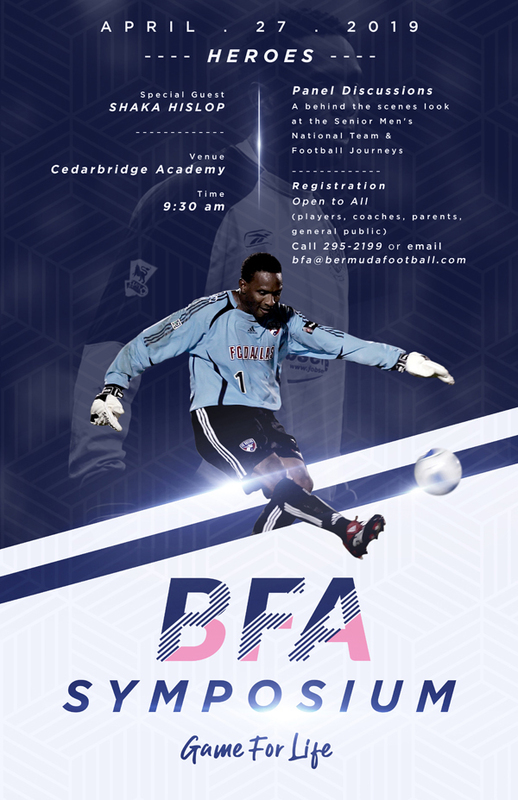 “The BFA is very proud to have as our special guest for the Awards Gala, former Trinidad & Tobago international and West Ham United goalkeeper and current ESPN FC Analyst Shaka Hislop. Shaka is seen by many in his homeland and at West Ham as a hero and we are certain that he will have some very special words to say to our players and coaches during his time in Bermuda. “As in previous editions of the BFA Awards, the Association will celebrate the most outstanding performers from this past season in both the Premier and First Divisions. “Players and Coaches who were nominated by their Clubs will be recognized in following categories: Best Defensive Player, Best Goalkeeper, Coach of the Year, Most Valuable Young Player and the coveted Most Valuable Player of the Year. “Awards will also be presented to the Fair Play Team of the Year and the Highest Goal Scorer. The Young Referee of the Year and the Referee of the Year will also be awarded. “The Association will also be recognizing five Legends who will champion the 2019 edition of the BFA Legends Scholarship awards. “The Association will also present it Order of Merit Awards which recognized those individuals and organization that have made significant contribution to the Bermuda Football Association and the sport of football general at the Association level or within their Club. “Tickets to the Awards Gala are $20.00 and will go on sale this coming Friday, April19th from the BFA Office. For more information on the Annual Awards Ceremony, please call the BFA Office at 295-2199 or email bfa@bermudafootball.com. “In closing, we would like to take this opportunity to thank our players, coaches, Clubs, referees and fans for their tremendous support ensuring that another football season has been completed. Many thanks also to our corporate sponsors and the Bermuda Government for their continued support of the BFA and our programs.